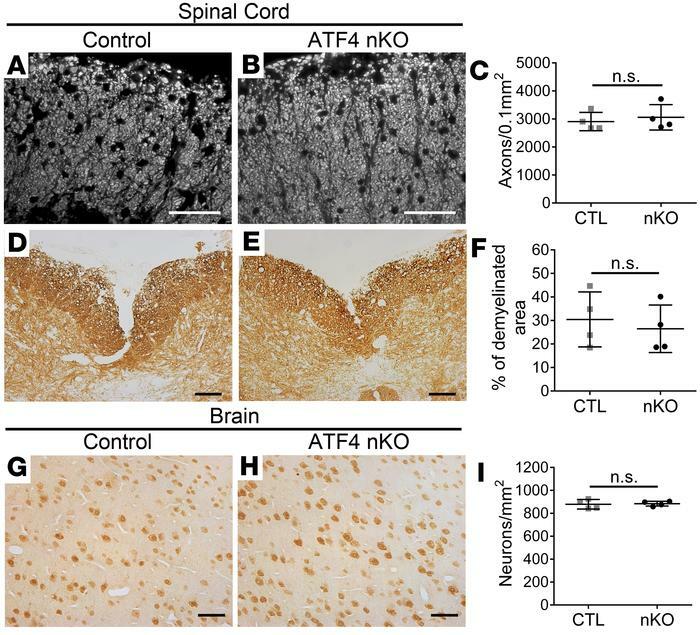 Neuron-specific ATF4 did not affect axon loss, demyelination, or neuron loss during EAE. (A–C) SMI31 IHC shows that neuron-specific ATF4 inactivation did not change the number of axons in the lumbar spinal cords of EAE mice at PID 60. (D–F) MBP IHC shows that neuron-specific ATF4 inactivation did not change the extent of demyelination in the lumbar spinal cords of EAE mice at PID 60. (G–I) NeuN IHC shows that neuron-specific ATF4 inactivation did not significantly change the number of neurons in the layer V of the primary motor cortex at PID 60. Scale bars: 50 μm (A, B, G, and H); 100 μm (D and F). n = 4 animals. Error bars represent SD. Statistical analyses were done with a 2-tailed t test.